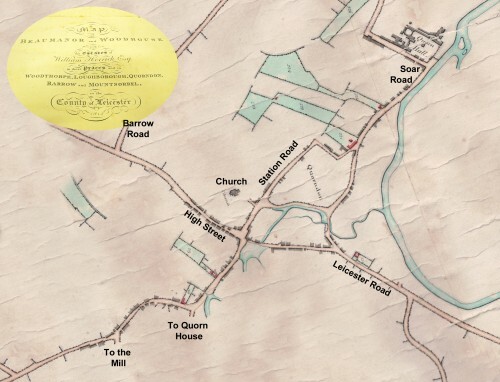 Before the first Ordnance Survey maps, (1880s for Quorn), maps were only made privately and for a reason, usually by landowners to document their holdings. The map from which this extract was taken, was drawn up in 1815 to document the estates of William Herrick. Although most of the Herrick family property was in Beaumanor and Woodhouse, the map includes surrounding villages. The map has been turned round to face north at the top, and some street names have been added to help with interpretation.